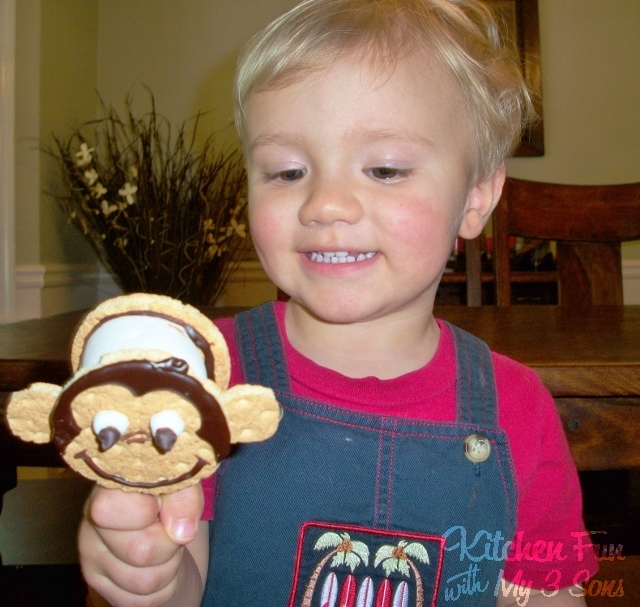 This is day 2 of our Curious George week that we have dedicated to my youngest and biggest George fan! We are known for our S’mores pops and they are always my boys favorite treat. 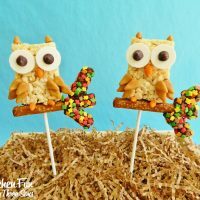 We thought it would be cute to make George S’mores and we think these turned out so cute! 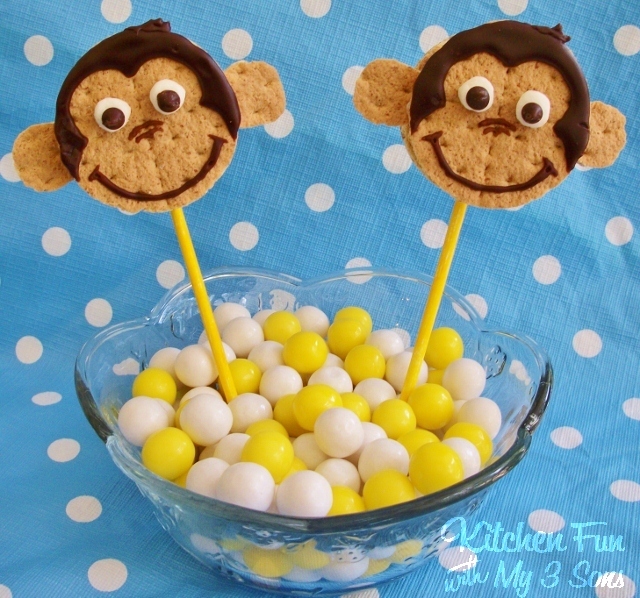 They are very easy to make and would also be fun for a Curious George party! 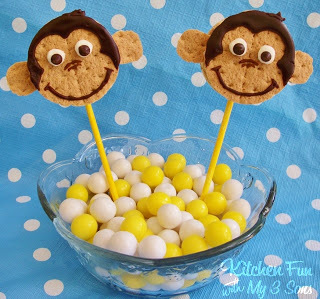 Make sure to check back with us every day for more fun George food ideas and our own Curious George party! 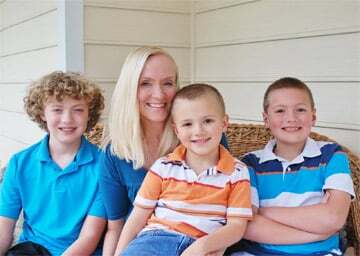 Take your 2 graham crackers and break them apart at the markings. 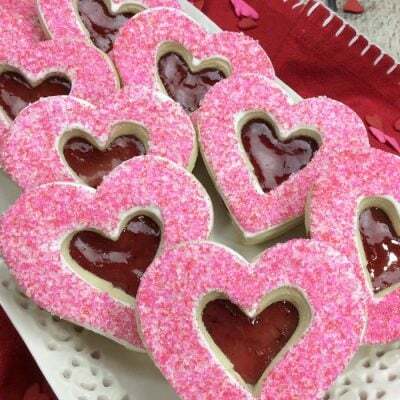 Take your small round cookie cutter and cut the 4 pieces into circles. 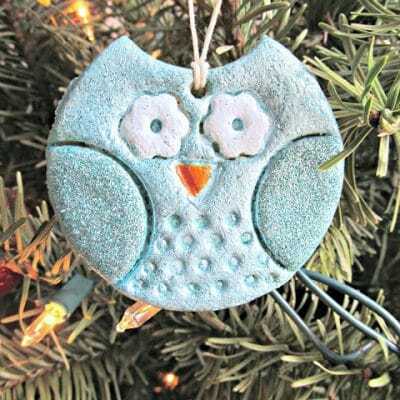 If you do not have a round cookie cutter then just cut around the edges with kitchen scissors. 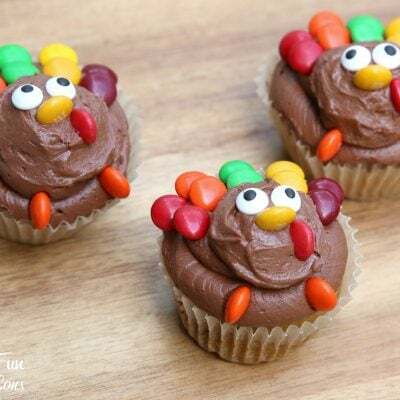 Squeeze your chocolate cookie frosting on the insides of the round graham cracker cut outs. Cut the jumbo marshmallow in half. Place the halves on the frosted side of the grahams. Let dry. 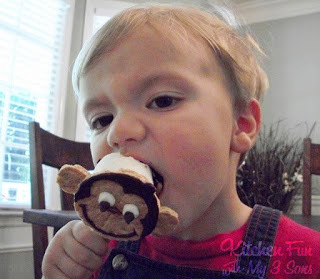 Squeeze the chocolate cookie frosting on the top of the face to make the hair, mouth, and nose. You might need a tooth pick to help out on the nose. Cut the mini marshmallows in half and attach with the frosting. 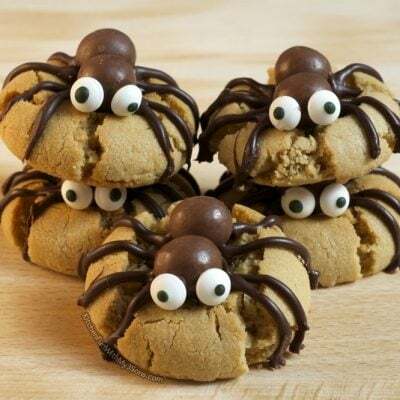 Do the same with the mini chocolate chips for the pupils. Cut out the ears from the graham scraps using kitchen scissors and attach with the frosting on the back of the front graham. Push a lollipop stick through the bottom center of the marshmallow. 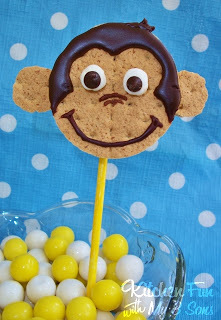 That’s it and now you have a super cute Curious George S’more Pop! Here is my excited 2 year old with his George pop! He gave him a big kiss and LOVED his George Pop! This little one doesn’t think so! You are so yummy George! « Previous PostCurious George & The Man in the Yellow Hat Breakfast! 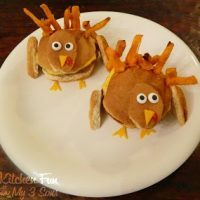 Next Post » Curious George Burger with a side of The Yellow Corn Hat! aw that is just so fun and how cute is that kid of yours! 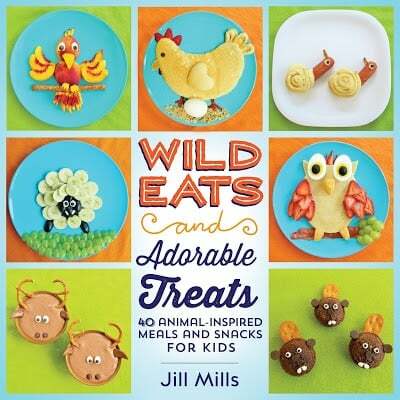 You've done it again =) Amazing – Adorable – All together wonderful! 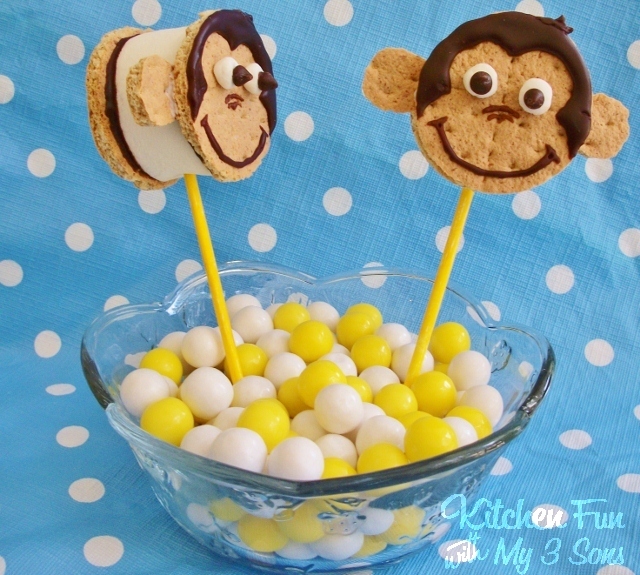 These s'mores pops are so cute! 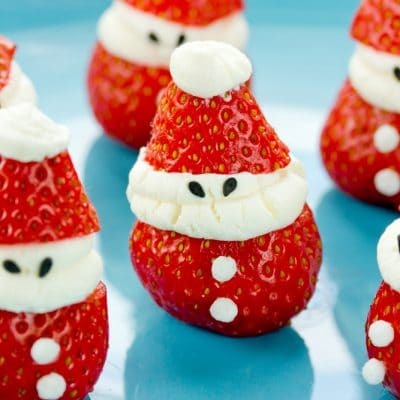 I agree that they're almost too cute to eat, but if you get the right set of monkeys around I think they'd be gone in seconds. Very creative! So So So cute!!! 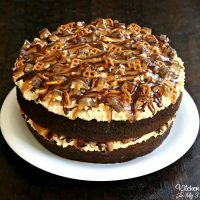 I love these so much, these would be great for school parties! Too cute! I'm glad to learn that you can cut graham crackers into shapes. I would have thought they would shatter into a million pieces. dont the graham crackers break when you try to cut them into circles?? ?